Kerry Rhodes (born August 2, 1982) is an American actor and former American football safety in the National Football League. He was drafted by the New York Jets in the fourth round of the 2005 NFL Draft, and most recently played for the Arizona Cardinals in 2012. Rhodes was named to All-Pro teams by three publications after the 2006 NFL season. He played college football at Louisville. Rhodes was born in Birmingham, Alabama to Jubrella and Jerome Rhodes and began playing football at nine years old. He was a starting quarterback and honor student at Jess Lanier High School in Bessemer, Alabama. As a junior, he threw more than 1,500 yards and 15 touchdowns while rushing for 500 yards and three scores in 1998; guiding Lanier to a 10-2 record. During his senior season, Rhodes threw for more than 1,600 yards and ran for another 850. He was also selected Metro Player of the year and first-team All-state in basketball of which he led his team to the 6A title game. In 2000, Rhodes joined Louisville as a quarterback, but was moved to safety Rhodes finished his first season at Louisville with 9 tackles, three pass breakups and an interception. As a reserve in 2002, he had 18 tackles (12 solos), a forced fumble, two pass deflections, a blocked kick and an interception. Rhodes took over as a free safety in 2003 and registered career highs with a sack, 82 tackles (61 solos) and three stops for losses. In 2004, he closed out his college career with 167 tackles (101 solos), a 12-yard sack, 18 pass deflections and 11 interceptions for 106 yards in returns. Rhodes was accorded first-team All-Conference USA honors that same year. 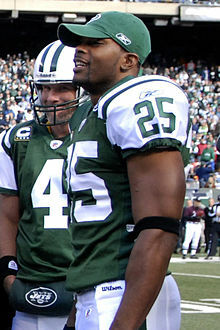 Rhodes was drafted in the 4th round (123rd overall) of the 2005 NFL Draft by the New York Jets. That same year, he beat out Oliver Celestin for the starting job at strong safety and started in 16 consecutive games in 2005. In his first professional season, Rhodes recorded 108 total tackles (85 solo), a sack, an interception, 9 pass deflections and a forced fumble. On September 24, 2006, he made a pivotal play against J. P. Losman of the Buffalo Bills, stripping the ball from the quarterback's hands and allowing Shaun Ellis to return the fumble for a touchdown. This helped the Jets to a 28-20 victory. He was named AFC Defensive Player of the Week for week 3. In Week 7, Rhodes intercepted a pass by Detroit Lions quarterback Jon Kitna. In Week 12, during the game against the Houston Texans, Rhodes intercepted a pass by quarterback David Carr in the second half. Following the 2006 season, Rhodes was named to All-Pro team by the Associated Press. On April 9, 2008, Rhodes signed an extension with the Jets for five years, for a total of $33.5 million, with $20 million guaranteed. On March 6, 2010, Rhodes was traded from the New York Jets to the Arizona Cardinals for a 2010 4th round draft pick and a 2011 7th round pick. Later, his Jets coach Rex Ryan criticized Rhodes in his memoir, saying, "He wouldn't work, and he was a Hollywood type, flashy and needing attention". Rhodes started and played in all 16 regular season games of the 2010-2011 season for the Cardinals, recording a total of 90 tackles, 78 solo, 12 assists, 1 sack, 12 passes deflected, 4 interceptions returned for a total of 174 yards, longest returned for 66 yards and 4 fumble recoveries. On December 31, 2010, Rhodes was awarded The Lloyd Herberg MVP award for the 2010-2011 season by the Arizona chapter of the Pro Football Writers Association. In 2011, Rhodes was inducted into the Kentucky Chapter of National Football League Players Association Hall of Fame along with Lou Michaels, Dale Lindsey, Rod Hill and Phil Simms. He finished his 2012 season with 58 tackles, nine assists, four interceptions and two forced fumbles, and was named the fourth best safety in the league by Pro Football Focus. Rhodes was released by the Cardinals on March 13, 2013. Rhodes was due to receive $5.5 million for the 2013 season and rejected an offer to restructure the contract at one year and $3 million. In a February 2014 interview with ESPN, Rhodes denied that he was blacklisted by NFL teams. He said his absence from the league was "a product of me wanting to do other things and not finding the right opportunity," referring to his interests in acting and producing, and the amount of money offered. In 2016, it was announced that Rhodes was engaged to Australian actress Nicky Whelan. Rhodes and Whelan were married in Los Angeles on April 15, 2017. In October 2017, several news sources reported the couple were divorcing. ^ Forde, Pat (December 15, 2006). "Melodrama stirred by the straw of teenage celebrity". Retrieved 2014-02-11. ^ "Kerry Rhodes Profile". Louisville Cardinals Official Athletic Site. Archived from the original on 22 February 2014. Retrieved 15 February 2014. ^ "Individual Game-by-Game Summaries 2004-2005". Louisville Cardinals Official Athletic Site. Archived from the original on 22 February 2014. Retrieved 15 February 2014. ^ "Kerry Rhodes Stats". College Football at Sports-Reference.com. Retrieved 15 February 2014. ^ "The 2004 All-Conference Football team". College Football - ESPN. Associated Press. Retrieved 15 February 2014. ^ "Kerry Rhodes Stats - ESPN". ESPN. Retrieved 2014-02-11. ^ Berg, Ted (April 9, 2008). "Jets, Rhodes agree on extension". SNY. Archived from the original on February 22, 2014. Retrieved 2014-02-11. ^ "New York Jets trade safety Kerry Rhodes to Arizona Cardinals for two picks - ESPN". Associated Press. March 6, 2010. Retrieved 2014-02-11. ^ "Rex: Jets Are Giants' 'Big Brother'; Gholston 'A Phony'". WFAN/Associated Press. April 27, 2011. ^ Urban, Darren (December 31, 2010). "One final practice and some awards". blog.azcardinals.com. Arizona Cardinals. Retrieved 7 May 2015. ^ Cosby, Chip (February 13, 2011). "Kentucky football notebook: Cobb's NFL Draft stock on the rise". KentuckySports.com. Kentucky.com. Retrieved 7 May 2015. ^ Busbee, Jay (September 15, 2013). "Why doesn't Kerry Rhodes have a job in the NFL?". Shutdown Corner. Yahoo! Sports. ^ Hanzus, Dan (2013-03-13). "Cardinals reportedly cut ties with Kerry Rhodes". National Football League. Retrieved 2013-03-13. ^ Florio, Mike (September 14, 2013). "Rhodes may have rejected offers in March, but he's still getting no interest now". Pro Football Talk. NBC Sports. ^ MacManus, Jane (February 18, 2014). "Kerry Rhodes: I wasn't 'blacklisted'". ESPNNewYork.com. ^ "Nicky Whelan Talks Engagement to Fiancé Kerry Rhodes — See Her 6.5 Carat Diamond Ring!". people.com. Time, Inc. Retrieved 2017-03-28. ^ "KERRY RHODES BALLIN' ON THE BEACH With Hot Fiancee". tmz.com. EHM Productions, Inc. Retrieved 2017-03-28. ^ "Neighbours actress Nicky Whelan marries NFL star Kerry Rhodes in Los Angeles". Fix. Nine Network. April 17, 2017. Retrieved April 17, 2017. ^ "That was quick! Australian actress Nicky Whelan confirms she has SPLIT from her husband Kerry Rhodes after just six months of marriage". Daily Mail. Retrieved 14 November 2017. ^ "KERRY RHODES & NICKY WHELAN OUR MARRIAGE IS OVER ... After Less Than 6 Months!!!". TMZ. Retrieved 14 November 2017. Wikimedia Commons has media related to Kerry Rhodes.